The FoodSafe Analyzers provide a fully integrated, real-time food quality analysis tool. 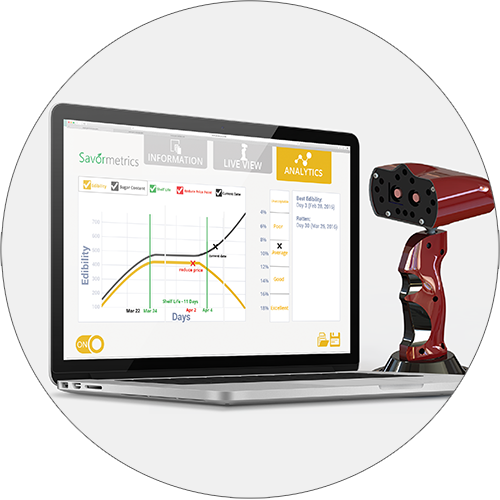 The integration of cutting-edge hardware and software technology allows for non-destructive quantitative and qualitative measurements of fresh food products. Your desired biochemical and biophysical quality metrics are extracted and analyzed using advanced artificial intelligence algorithms. 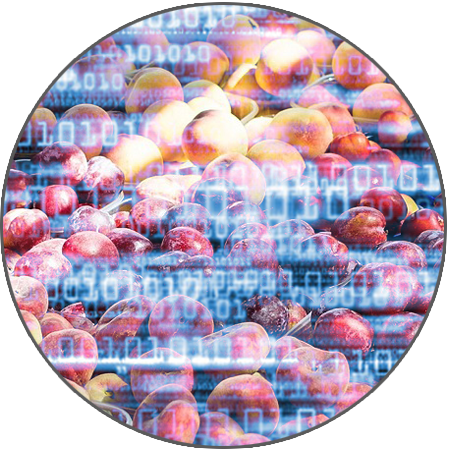 Our team of food scientists and engineers will train the algorithms to help achieve the business outcomes you desire. This results in reduction in spoilage expenses and an increase in revenue. Savormetrics’ software translates your data into meaningful business knowledge for you. We will work with your staff to identify meaningful quality thresholds to meet your business needs. You and your staff will not need to waste time on interpreting scientific data. 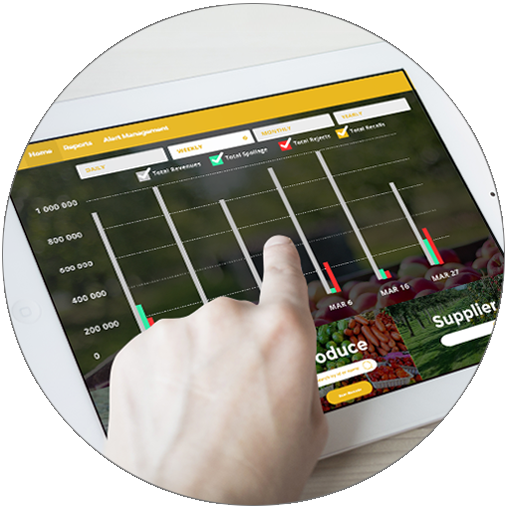 Data will be presented in a customized manner that provide decision-making support to your staff along your supply chain. A workflow element is incorporated into the decision support software design allowing for seamless integration into your business process. These elements may include task tracking, alerts, red flags and reporting. Perfect for portable use by sales associates and procurement officers. Quality analysis for grains and pulses. Perfect for farmers and grain handlers. Does working on disruptive, innovative solutions get you excited to come into work in the morning? Does building solutions that impact a bigger global cause make you care about your role? Does working on a high-powered multi-disciplinary team get your creative juices going? If you’ve ‘ed ALL of the boxes above, read further…. Do you prefer working in a non-hierarchical flat environment? Do you prefer working in an environment where you do huddles as opposed to getting “meeting’ed to death”? Do you prefer an environment where no one counts your vacation days? Do you prefer an environment where your thoughts are valued based on ingenuity and not seniority? If you’ve ‘ed ALL of the above, we’d like to hear from you, whether there is a job posting applicable to you below or not. At Savormetrics, we value real talent. 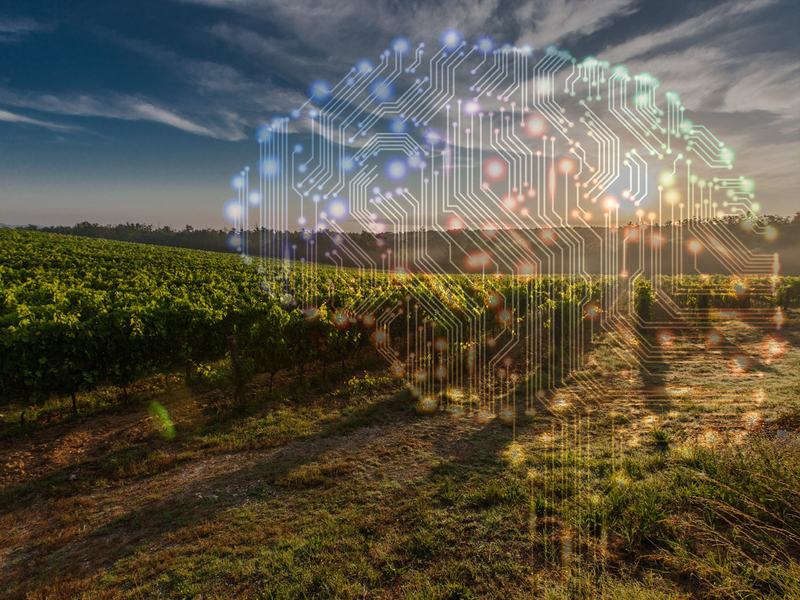 The Senior Data Scientist will contribute to the development of Artificial Intelligence driven sensing solutions designed for the food and agriculture sector. The successful individual will immediately contribute to the development and implementation of Artificial Intelligence Platforms that include various machine learning methodologies. The development of machine learning algorithms will include but are not limited to artificial neural networks, deep learning, self/auto learning and SVMs for various customer applications. In addition to this, the Senior Data Scientist should have familiarity with data processing methods including image processing, signal processing and pattern recognition. Demonstrate commitment to professional development. Experience in optics / scientific instrumentation space is beneficial. CORE TRAITS YOU MUST HAVE TO BE PART OF OUR TEAM! The Software Developer will contribute to the development of software applications and solutions for our Artificial Intelligence driven sensing solutions designed for the food and agriculture sector. The successful individual will immediately contribute by developing full software applications from designing user-friendly and intuitive GUIs to database architecture and integrating them with our sensing technologies through the use of SDKs. They will also be responsible for ensuring that appropriate software platforms are used to complement the hardware for optimal performance and meeting customer requirements. 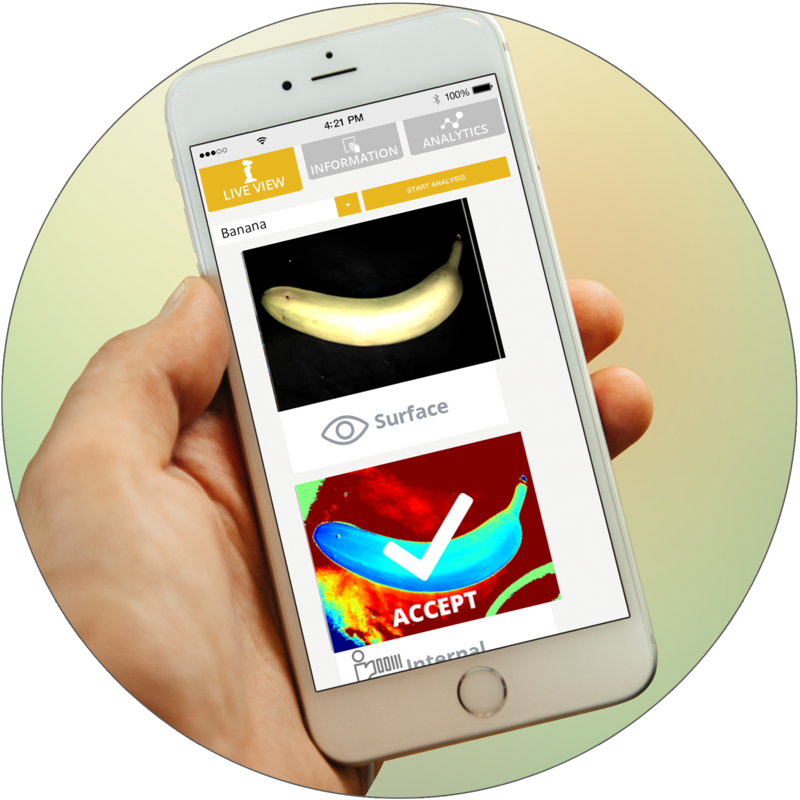 Savormetrics is an industry leader in rapid testing technology and Artificial Intelligence. Our sensing devices are used to detect quality characteristics. Our software applications make our devices smarter and easier to use while providing intelligence to address customers’ specific needs. At Savormetrics, we are disrupting the way food companies make critical business decisions by providing novel, predictive metrics. Our technology helps reduce food waste which provides an economic, social and environmental benefit to businesses and society. Our applications are being used by leading multinational food companies. Are you an agent of change and disruption? Are you looking for an environment that is at the forefront of cutting-edge technology, AI thought leadership and want to be part of a highly creative and intelligent cross functional team? If so, then you want to join the Savormetrics team! We are an agile and leading edge scale up with the operational intelligence of a global business. We are a creative company that runs many innovative projects to develop technologies that are in demand. We promote continuous learning in a dynamic, fun and flexible work environment. We involve our staff in setting visionary goals, and together we are passionate about building industry defining, impactful products for the marketplace! • Capable of creating high-quality, efficient, and well-tested software. The Senior Optical Engineer will contribute to the development of sensing solutions designed for the food and agriculture sector. The successful individual will immediately contribute by designing optical sensors based on free space optical elements. The sensors will be designed with considerations for manufacturability. They will also be responsible for working closely with Director, Product Development to make sure the designed optical elements work well in a product. The selected individual will work closely with our customers to make sure that the designs incorporate the usability needs for seamless adoption. Experience with Microfabrication processes will be an asset. The Senior Analytical Chemist will specialize in analyzing chemical substances as well as perform chemometrics. They should have a strong background in using complex equipment that may include spectroscopy, chromatography, electrophoresis, and mass spectrometry to test and quantify samples for the purpose of integration into Artificial Intelligence frameworks. This individual will work closely with Hardware Designers, Data Scientists, and Business Analysts to build real world solutions for the Food industry. Bachelor’s, Master’s or PhD degree in Chemistry, Engineering. 5+ years work experience in Pharmaceutical, Food, or related industries. Advanced experience in using analytical instrumentation which include: GC-MS, HPLC, UV-Vis, FT-IR, etc. Experience in Python and MATLAB and other similar software languages. Advanced skills in chemometrics and mathematical modeling while working with large data sets. As a Controller, you will be responsible for the accounting/finance operations of the company. This includes, but is not limited to, general bookkeeping, monthly reconciliations, HST and other filings, payroll administration, financial reporting/analysis, A/R, A/P, and cash management. You will also help to analyze financial performance of the business including macro and micro level budgeting and forecasting, developing and improving processes and systems. In addition, you will be responsible for preparing monthly/quarterly/annual financial statements and working with an external accountant. Additional controller duties as assigned. Experience with accounting and expense management software systems.